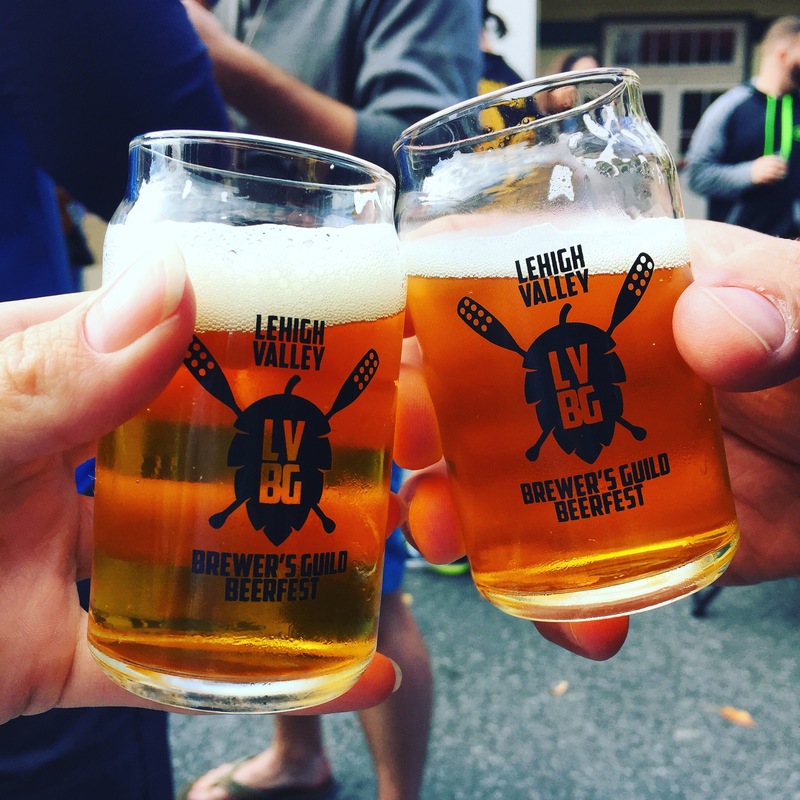 Lehigh Valley Brewers Guild Beerfest 2016 | Two Pints, Please! A beer-loving couple exploring the Lehigh Valley, PA (and beyond!) with fresh pints in hand. October 27, 2016 October 27, 2016 / Two Pints, Please! We have been blown away by the rising craft beer scene right at home in the Lehigh Valley. Not only are fantastic small breweries opening everywhere from Easton to Emmaus, but the beers are truly remarkable with unique, mature, and complex flavor profiles that rival many breweries that have been operating for years. This past Sunday, we were thrilled to attend the Lehigh Valley Brewers Guild Beerfest, which celebrated the Lehigh Valley craft beer scene. This is the first festival of its kind – with only local brewers featured – and it was a huge success. The weather was perfectly cool and crisp for this festival held right outside of Two Rivers Brewing in Easton, PA. There was a great crowd – enough for a fun atmosphere but not so much that you had to wait in lines to get your glass filled. The live music was fantastic, and the food options were perfect. We got to see some of our old favorite local breweries, including Bonn Place Brewing Company, Lost Tavern Brewing Company, and Yergey Brewing, and we started planning blog posts for other awesome local breweries, including Cave Brewing Company, Sole Artisan Ales, Funk Brewing, Hijinx Brewing Company, Weyerbacher, Two Rivers Brewing, Fegley’s Brew Works, and for a beer alternative, the Allentown-based (and excellent!) Colony Meadery. Now, let’s talk about the beers. Each brewery poured a few different options ranging from classic brews from each brewery to seasonal or unique small-batch brews. We tried nearly all of the options and will share our favorites from each brewery. Check it out below. Bonn Place: We have raved and raved about Bonn Place for their fantastic beers, cozy atmosphere, and incredibly friendly owners. Sam’s excitement to share his beers and connect with patrons at the festival was tangible – mid-way through the festival, he told us,”this is what it’s all about!”. Their Beerfest offerings did not disappoint, including Colin’s Irish-Breakfast Stout, the Lapin L’Orange Double Farmhouse, and the Gose Busters Lacto-Cooler (that name!). Mike was all about the Colin, a collaboration beer developed with Keystone Homebrew, due to its malt-forward, oaty taste. I was surprised to find that the Lacto-Cooler was a hit for me; I am not big on sour beers, but I found this gose to hit the spot. It has a mild saltiness which cuts the acidic sour, producing a slightly tart but well-balanced brew. Cave Brewing: Cave is close to the top of our list for a full blog post feature. They are a nano brewery located near Bethlehem, PA with plans to eventually open their brewery doors to the public. Despite not being open just yet, their beers are popping up all around the Lehigh Valley and are garnering a loyal following. They poured the Gourdolious Spiced Pumpkin Ale and Drew’s Hand Stout. The Gourdolious is a single-batch heavy-hitting pumpkin ale, made with two pounds of pumpkin. Crazy. Meanwhile, the stout has sweet notes of cocoa and roasted coffee that complement the malt-forward taste nicely without being too overpowering. Mike was a big fan of the stout and was craving more after the festival ended. Can’t wait to check Cave out again in the future! Lost Tavern: Lost Tavern has a special place in our hearts. It opened only a few months after we bought our first home in Hellertown, and we couldn’t wait to check them out. It has now become one of our regular stops for local craft beer due to its energetic and fun atmosphere, unique brews, and crazy good live music. They did not disappoint at the LV Brewers Guild Beerfest, pouring the Hop Air Balloon American Pale Ale, Fall Spiced Cider, and Maple Bacon Amber. Mike loved the hoppy bite of the pale ale and I was smitten by the cider. Many hard ciders are very dry, but this one is semi-sweet and much more juicy and full bodied than others we’ve had. The Maple Bacon Amber brought lots of smoke and sweetness for a unique fall beer. Funk Brewing: Funk Brewing became a popular Lehigh Valley brewery right off the bat when it opened in 2014 in Emmaus, PA. Their beers pop up in many area restaurants and are highly sought out in the valley and beyond. They have even opened a second location in Elizabethtown, PA due to their high demand. While we plan to do a full blog write-up of Funk in the coming months, we can tell you that their brews are not to be missed. They poured the T-Rex IPA and the Falliage Chai Saison at the Beerfest. We sampled both, and the T-Rex was the front-runner for us. While bitter with the classic IPA hoppiness, it packed a juicy, fruit-forward brightness that left us craving more. The Falliage was a unique saison with its notes of chai tea and a bitter finish. Hijinx Brewing Company: Hijinx is another small local brewery that first opened in Allentown, PA in 2011. Over the years, Hijinx has amassed a steady following and has since upgraded their brewing space from a 400 square-foot garage with a single-barrel brewing system to a 4000 square foot space with a 10-barrel brewing system. Mike and I visited Hijinx last year and were very impressed not only by their beers but by the friendliness of the staff. We were also thrilled to find that this unassuming building also hosts the Colony Meadery as well as County Seat Spirits distillery – what more could a proud lush want? Hijinx had some great pours at the Beerfest, including my favorite of theirs, the Barista’s Choice, which is an ultra cozy porter with Honduran coffee beans roasted by the Taylor Roasted Coffee House in Northampton, PA. There’s nothing we love more than seeing local business collaborate and support one another. Keep an eye out for more blog action featuring Hijinx in the coming months. Two Rivers Brewing: Two Rivers, the host of the festival, opened in 2013 in Easton, PA. A full-service restaurant plus brewery, it is a great place to enjoy a gastropub menu (hello, duck fat fries with truffle oil!) while drinking excellent craft beer. Two Rivers recently blew up in local media for winning a gold medal (one of only two golds in the entire state of Pennsylvania) for the Six Fingers Sam at the Great American Beer Festival this year! They have a lot to be proud of. At the Beerfest they poured the Bomb Maker Bock and Sixth Street Sour, and we were lucky enough to snag a sample of the Six Fingers toward the end of the event. The bock was a big hit with Mike with a load of roasty, malt flavor laced with a bourbon kick from being aged in bourban barrels. The Six Fingers Sam was incredibly unique – a true farmhouse saison with a major funky streak from the Brett hops balanced by more delicate notes of chardonnay and lemon. A big congratulations on the gold medal win! Sole Artisan Ales: We have heard about the enigmatic Sole Ales but hadn’t had the chance to taste their offerings or meet brewer Joe Percoco until this event. Currently describing themselves as a “Gypsy Brewery,” Joe and his wife brew their beers at an already well-established brewery but plan to open their own brewing space in Easton in the coming months. Despite their current lack of a brick-and-mortar brewery, their beers already have a cult following and have garnered great respect in the local craft beer community. Mike and I were blown away by the Turbo Nerd, an incredibly smooth, juicy, melon-forward X-IPA. They also poured the Electric Velvet, an Imperial Latte Stout they concocted using cold-brewed coffee from Electric City Roasting. We can’t wait to try more from Sole! Yergey and his newly opened Yergey Brewing in Emmaus, PA. Jim’s approach to brewing reflects maturity and a fine-tuned, well-honed craftsmanship due to years of homebrewing. His passion for his beer is clear in his interactions with customers and excitement to share his brews with others. He poured a couple familiar favorites, the Hoptileitious Double IPA and the Friend of the Devil Belgian Dark Strong, for the Beerfest. You can’t go wrong with the Hoptileitious – although it packs a lot of hops, it has a smooth maltiness that makes it go down easy. Friend of the Devil is the quintessential fall/winter beer with notes of winter spices, caramel, and dark fruits. Partway through the festival Jim poured some of the Hot Chocolate, a chocolate porter laced with spicy chili peppers. Mike and I missed the boat on the Hot Chocolate since it was tapped out in 15 minutes! Also, how cute are these new double-walled beer tumblers they are selling? Weyerbacher: Ok, time to be honest here. Weyerbacher is one of the most well-established breweries in the Lehigh Valley, founded in 1995 in Easton, PA. Its beers are found far and wide, especially their big sellers like the Merry Monks Tripel and the Imperial Pumpkin Stout. Weyerbacher is also active in giving back to the local community with food drives and supporting home brewers in the area with yearly competitions. Despite its popularity, Mike is just not a fan of their beers. He claims he has tried many of them and has yet to find one he likes. While I haven’t yet been totally smitten by any of their pours, I have been pushing us to sample them whenever we can to find that elusive Weyerbacher beer that hits the mark. At the Beerfest, I was pleasantly surprised by the Easton Brown and Down, a roasty chocolate brown ale that was a great pairing for the cool, crisp weather. Mike enjoyed it as well, though he remains skeptical. This could be a turning point in our relationship with Weyerbacher – only time will tell. Fegley’s Brew Works: Brew Works is another well-established Lehigh Valley brewery + restaurant with two locations in Bethlehem and Allentown. Their beers are frequently found throughout PA and NJ and have received multiple awards at national beer festivals. Mike and I have sampled their beers regularly over many years and can attest to the quality and growing diversity of their selection, including the Black IPA and Devious Imperial Pumpkin. They poured the Pumpin’ Ain’t Easy Dry Hopped Kettle Sour and the Fall Bock at the Beerfest. Since you know about our feelings about sour beers, we both went for the Fall Bock and weren’t disappointed. It’s an easy-drinking, toasty fall beer with warming malts and notes of vanilla and cocoa nibs. It would go down especially easy with an order of their soft pretzels with beer cheese soup! We have to give a quick shout-out to Colony Meadery who produce a wide range of meads right in Allentown, PA. If you haven’t had mead, you should give it a try for something a little different! Made from fermented honey, we love its smooth texture and versatility for mixed drinks or enjoying on its own. The Better Sasparilla variety, which they offered at the Beerfest. is downright addictive. Another special thanks to Porters Pub for offering an incredibly good sauerbraten sandwich and cheddar ale soup to keep us warm (and relatively sober) during the event. We could go on and on about our excitement for the craft beer scene in our region, but you probably already stopped reading a while ago. So we’ll pack it in and see you next time! Pingback: The Best of Allentown: HiJinx, grain., and Cork and Cage | Two Pints, Please! Ella, You Had Me at Barrel-Aged Quad!